You can use the databases linked below to search for product labels, and Safety Data Sheets (SDS). Some manufacturers post these items on their websites. Visit our manufacturer list to find websites and contact information for hundreds of pesticide manufacturers. There may be several versions of each pesticide product label. You are legally responsible for following the label directions on the product container, as you purchased it. Many states add restrictions to federally approved pesticide labels to address specific concerns in the state. An SDS is required to have specific information in the Hazard Communication Standard set forth by OSHA, but they are not reviewed or approved by government officials like pesticide labels. NPIC Product Research Online (NPRO) - National Pesticide Information Center Designed for professionals using desktop computers, this tool performs powerful product searches and is lightning quick! Search for pesticide products by name, EPA registration number, manufacturer, use site, active ingredient, pest, product type, formulation, signal word, or a combination of these. Refine previous searches using additional criteria and view individual product information in a simple format. See synonyms for active ingredients and follow them directly to EPA’s ChemSearch related science and regulations. Product details and federal product labels can be bookmarked or shared. A mobile version, MAPL, is available with fewer features. NPIRS Pesticide Products Information System (PPIS) - Purdue University The National Pesticide Information Retrieval System (NPIRS) uses data from U.S. EPA's Pesticide Product Information System (PPIS) to retrieve information on EPA-registered and cancelled pesticide products, chemical ingredients, and firms/registrants. Pesticide Product Label System (PPLS) - Environmental Protection Agency (EPA) Search for pesticide product labels by EPA Registration number. Household Products Database - National Library of Medicine This database includes health and safety information on household products. CDPR Databases - California Department of Pesticide Regulation (CDPR) Search for chemical ingredients, products, labels and registrant information for pesticide products registered in California. DoD Standard Pesticides and Pest Control Equipment Lists - Armed Forces Pest Management Board These lists include product labels and SDS for each product. CDMS Label and SDS Database - Crop Data Management System, Inc. This collection includes product labels and SDSs for agricultural pesticide products. Pesticide Manufacturers - NPIC Find their websites, contact information, and direct links to their product search interfaces. 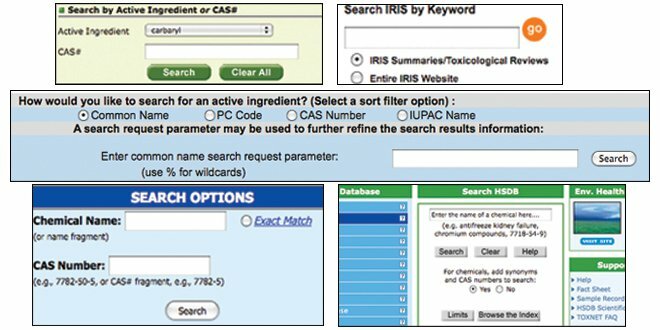 National Pesticide Information Retrieval System (NPIRS) Searchable Databases- Purdue University This collection of pesticide-related databases is available through subscription.